Some love it and some hate it. I happen to be one of those who really enjoyed high school as does this Wake Forest senior. 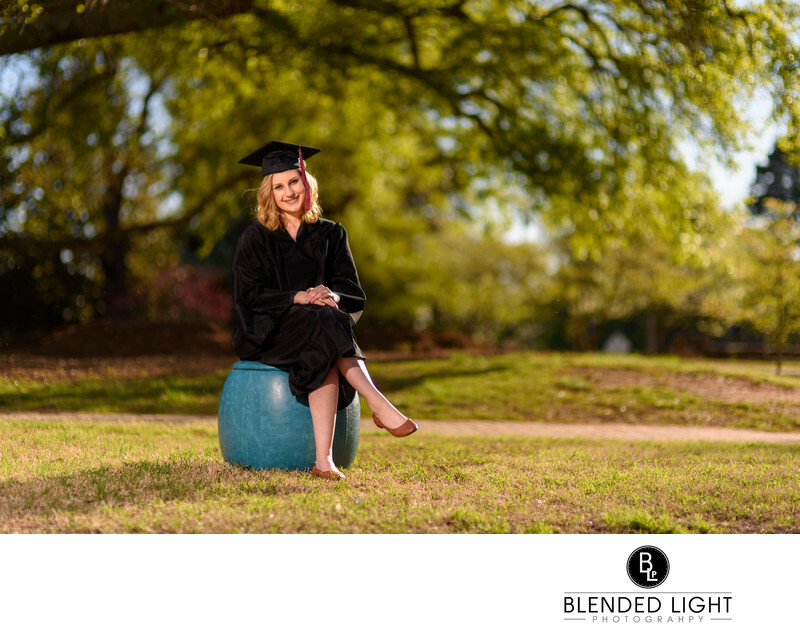 She was looking to do her senior session in the Wake Forest area, where she lived and went to school. She moved here recently from Texas and would be heading back there for college, but wanted to remember this time. We started with some locations downtown Wake Forest, then moved over to Southeastern Seminary. The Seminary campus is a gorgeous, open air location, littered with large trees and colorful flowers. Using some of these open areas, I placed the senior and her colorful seat with the sun to her side. Normally, I would put the sun at her back, but with this shot, I did't like the background appearance, so I went to the side. To balance out the side lighting from the sun, I placed my off camera flash opposite the sun, to provide light on her shaded side. I maintained the highlights in her hair, legs and arm by underexposing the scene so as to not lose them. I then used sufficient power from my flash to ensure that the flash's light was strong enough to kill the shadows as well as blend nicely with the natural sunlight. A gorgeous senior with a stunning image to remember the moment! Location: Southeastern Seminary, Wake Forest, North Carolina. 1/2500; f/1.4; ISO 50; 85.0 mm.